Available prints and solids are shown below. This block of fabrics consists of medium weight lycra blend fabric. 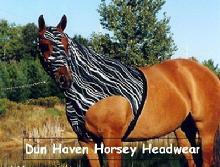 Dun Haven offers only the finest in American made Lycra blend fabrics for Dun Haven Horsey Headwear! Click on the thumbnails below to enlarge the samples. Try one of these new Xtreme fabrics. These hoods are unique, no two are exactly alike! 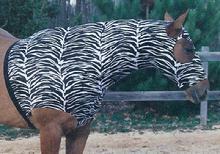 This durable 4 way stretch, medium weight fabric is gorgeous! The solids below are the Dun Haven Heavyweights. This is the fabic that is used to make NFL uniform pants. It is a durable 4 way stretch weighing 9.5 + ounces per square yard. That's almost twice the weight of standard Lycra fabrics! 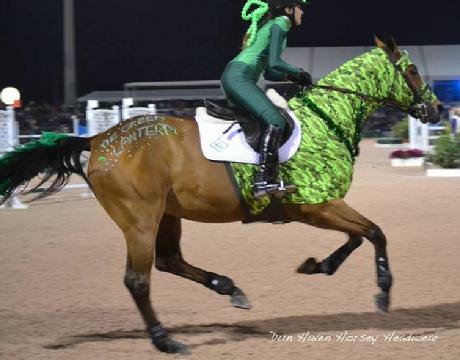 This fabric will be rugged wear for your horse just as it is for the football players on your favorite NFL team! Custom sizes also available. Contact us at dunhaven@tds.net for more information. 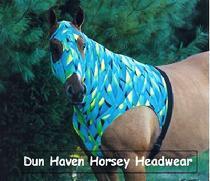 Dun Haven Farm LLC offers two distinct styles of hoods: full shoulder or hi cut. Be sure to specify which you prefer when placing an order. Click on the Order and Contact Us page for easy and SAFE PayPal online ordering. Call Dun Haven LLC at 715-213-1735 for phone credit card orders.